In response to a growing interest, among historians as well as literary critics, in women's use of the epistolary genre, Women's Letters Across Europe, 1400-1700: Form and Persuasion analyzes persuasive techniques in the personal correspondence of late medieval and early modern women. It includes studies of well-known women (Isabella d'Este, Teresa of Avila, Marguerite de Navarre, Catherine de Medicis), of those less-known (Alessandra Macigni Strozzi, Louise de Coligny, Glikl of Hameln, Argula von Grumbach, Luisa de Carvajal y Mendoza, Anna Maria von Schurman, Barbara of Brandenburg ) and of others virtually unknown to history (prosperous women like Elizabeth Stonor and Cornelia Collonello and pauper women seeking poor relief in Tours). Comprehensive in scope, Women's Letters Across Europe, 1400-1700 looks at women from England, Italy, France, Spain, Germany, and the Netherlands, and from various levels of society, encompassing the nobility, the gentry, the middle class, and the poor. Each of the essayists considers letters both as historical documents giving insights into women's lives, and as texts in which variations on epistolary forms are used for specific persuasive purposes. The authors of the essays analyze their subjects' capabilities and limitations as letter writers and the techniques they used to influence correspondents, setting these observations in the framework of the women's particular 'stories.' Taken together, the essays and the letter writers discussed therein illustrate in new ways how far from silenced many early modern women were, how they were able to adopt and adapt strategies from the epistolary conventions available to them, and how they could have an impact on their worlds through their letters. 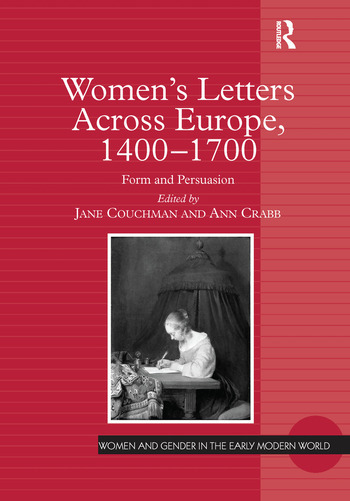 Contents: Introduction: Form and persuasion in women's letters, 1400-1700, Jane Couchman and Ann Crabb. Part I Persuasion for Family and Personal Goals: How to Influence Your Children: Persuasion and Form in Alessandra Macigni Strozzi's letters to her sons, Ann Crabb; 'A masterful woman': Elizabeth Stonor and English women's letters, 1399-c.1530, Malcolm Richardson; 'Much could be written': Glikl of Hameln's life in writing, Erin Henriksen and Mark Zelcer; 'I am the same Cornelia I have always been': reading Cornelia Collonello's letters to Michelangelo, Deborah Stott; Letters across the borders: strategies of communication in an Italian-German Renaissance correspondence, Christina Antenhofer; Isabella d'Este and the properties of persuasion, Deanna Shemek. Part II Public and Private Intersecting: 'I wold wyshe my doings myght be ... secret': privacy and the social practices of reading women's letters in 16th-century England, James Daybell; 'Give birth quickly and then send us your good husband': Informal Political Influence in the Letters of Louise de Coligny, Jane Couchman; 'Pregnant with 100,000 soldiers': the correspondence of Marguerite de Navarre and FranÃ§ois I, Barbara Stephenson; In the Queen's words: Perceptions of Regency Government Gleaned from the Correspondence of Catherine de Médicis, Elizabeth McCartney; 'Burdened with small children'. Women Defining Poverty in 16th-Century Tours, Susan Broomhall. Part III Validated by God and by Reason: 'Dear daughter': reform and persuasion in St. Teresa's letters to her prioresses, Alison Weber; The religious warrior: Luisa de Carvajal y Mendoza's correspondence with Rodrigo de CalderÃ³n, Elena Levy-Navarro; Form and persuasion in the correspondence of Argula von Grumbach, Peter Matheson; The French reception of Anna Maria van Schurman's letters on women's education (1646), Anne R. Larsen. Selected general bibliography; Index. Jane Couchman is Associate Professor of French, Humanities and Women's Studies at Glendon College, York University (Toronto). She has published articles and book chapters on the letters of late sixteenth- and early seventeenth-century Huguenot women: Louise de Coligny, Catherine de Bourbon, Charlotte de Bourbon-Montpensier and Eléonore de Roye. Ann Crabb (History, James Madison University) is the author of The Strozzi of Florence: Widowhood and Family Solidarity in the Renaissance (University of Michigan Press, 2000). Her current research deals with the correspondence of Margherita Datini (1360-1418) and her circle in Prato and Florence, investigating both the form and the content of the letters.